Compare the benefits of Heritage Essentials™ , Heritage Select™ and Heritage Couture™ bridal gown cleaning and preservation packages. All our services are backed by a 30 day satisfaction guarantee. Choose between two museum quality preservation methods: Museum Method™ (hanging) preservation which utilizes a cotton preservation bag and Heritage Box™ Preservation. Neither are sealed so you can inspect and admire your dress any time. Made of acid/lignin free materials, either provides the best protection against yellowing available. All of Heritage Garment Preservation procedures make sure YOUR gown receives the best protection available. We use authentic archival materials in our gown preservation packages and DIY kits. This means all our materials are both acid-free and lignin free. Some preservation providers use materials that are not acid-free. And many use materials that may be acid-free but are not lignin free. These boxes become acidic as the lignin breaks down accelerating the yellowing of the wedding gown inside. Both Heritage Couture™, Heritage Select™ and Heritage Essentials™ wedding gown care packages include free shipping, including inbound and outbound shipping. Packages are shipped via FedEx signature delivery which means we sign for your gown when it arrives and you sign for it when it returns. It is never left on a doorstep. Heritage Couture™ packages also include courier pick up and a free shipping kit. Your wedding dress will be cleaned by itself, either by hand or by machine as determined by your package selection. It will not be cleaned in large machines with other gowns. Wholesale dry-cleaners clean gowns in giant machines with as many as 30 other dresses at a time which could contaminate your gown. Heritage Select™ and Heritage Couture™ packages include services for all fabrics including silk. Heritage Essentials™ package includes service for synthetic fabrics only. Most wedding dresses are made from synthetic fabrics such as polyester. Polyester fabrics can look amazingly like silk. 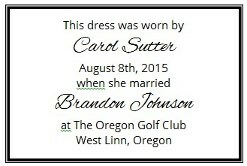 Add a personalized label to your wedding gown preservation. Choose what you’d like the label to say – be sure to include the bride and groom’s names, wedding date and location of the wedding. Heritage Box™ preservation includes Archival Intercept™ as an added protection. Made by 3M, Archival Intercept™ is a high tech addition to our Heritage Select™ and Heritage Couture™ box preservation. Archival Intercept™ neutralizes oxidizing gases in the air such as ozone, carbonyl sulfide, sulfur dioxide, hydrogen chloride, nitrogen dioxide and hydrogen sulfide giving added protection to your wedding gown. Heritage Select™ package – Wet cleaning or dry cleaning by machine. Upgrade to Hand Cleaning for additional fee. Heritage Couture™ package – Hand cleaning or dry-cleaning in virgin solvent by machine with hand spotting. Virgin solvent is either new, pure solvent or solvent that has been distilled to pure condition. This means that dry cleaned gowns will be thoroughly cleaned and oils and dirt from other wedding gowns will not contaminate your wedding gown. For yellowed wedding gowns, our whitening treatments are done individually and will return your gown to a nice off-white color. Restoration treatments are only available in our Heritage Select™ or Heritage Couture™ packages. Each gown that we clean includes a 30 day satisfaction guarantee. Heritage Couture™ wedding gown preservation includes a lifetime warranty against yellowing. Heritage Select™ wedding dress preservation includes a 30 year warranty against yellowing and Heritage Essentials™ includes a 20 year warranty against yellowing. Heritage Select™ gown restoration and preservation includes a 5 year warranty. Heritage Couture™ restoration and preservation includes a 10 year warranty. 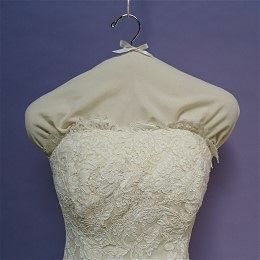 Your preserved wedding gown is protected from yellowing by being wrapped and filled with our acid and lignin free tissue or 100% museum quality cotton muslin. The tissue and muslin create a protective barrier between your garment and the potentially damaging chemicals found in the environment. For best results, replace your tissue every ten years. Muslin never requires replacing and should last forever. Heritage Couture™ preservation utilizes 100% natural, unbleached cotton muslin. Heritage Select™ and Heritage Essentials™ preservation uses acid/lignin-free tissue. You may upgrade to muslin preservation for an additional fee. Our Heritage Couture™ packages includes care for 3 bridal gown accessories, such as bolero jackets, shawls, veils, slips and gloves. One accessory is included in the Heritage Select™ packages. Heritage Essentials™ does not include any accessories, however accessories can be added for an additional charge. Heritage Essentials™ service package includes steam pressing. Heritage Select™ service package includes steam pressing with some hand pressing as needed. Our Heritage Couture™ service includes thorough hand pressing that will return your wedding dress to the best condition possible before preservation. Give your wedding gown or heirloom garment Priority Service which is guaranteed to be completed within 2 weeks (some exclusions apply) of our receiving it. Because we hand clean most garments individually, our normal processing time is 4 – 12 weeks. But with Priority Service, your garment will be moved to the front of the line. Your wedding gown (or other heirloom textile) will still receive the same expert care that all of our garments receive. Our Heritage Couture™ package includes a free shipping kit consisting of a shipping box, tape and pre-paid shipping label. We will ship the kit to your home or office. Heritage Essential and Heritage Select™ orders may purchase the kit separately for $20. Otherwise we will email your shipping label to you and you can ship your wedding gown in any sturdy corrugated box that you already own, or pick one up at your local shipping store for a few dollars. Our shipping box is a good size for most dresses and measures 20 x 20 x 12. Some wedding gowns have non standard, unusual embellishments that are beautiful but can be very challenging when cleaning and pressing and so may require unusual care. Some of these embellishments may need to be removed before cleaning and replaced after cleaning. Heritage Couture™ wedding gown cleaning and preservation includes care for all trims including nonstandard, unusual embellishments and will usually not accrue additional charges. There will be additional charges ($50 – $250) for Heritage Essentials™ and Heritage Select™ orders with wedding gowns that have these unusual embellishments. An example of non standard, unusual embellishments includes three dimensional appliques, feathers, hand painted or hand stamped designs, or complicated styles requiring many hours of pressing. Our expert seamstresses can repair your wedding gown to like new condition. Minor repairs are included in Heritage Select™ package our Heritage Couture™ package includes repairs up to 2 hours. Additional repairs are available for an extra fee for any package. Our Heritage Couture™ service includes door to door service with pick up of your wedding gown by our shipping courier. For Heritage Select™ service, just drop your gown off to any FedEx staffed locations or hand your packaged wedding gown to any FedEx ground driver. We can arrange courier pick up for Heritage Essentials™ and Heritage Select™ orders for a $20 fee.